There is something to be said for chewy, gooey candy bars. Not just chocolate bars – those are more like solid chocolate. But candy bars – the kind with something stretchy and sugary enrobed in sweet chocolate. We recently found Crispy Cat bars. They are vegan, 100% organic, gluten-free, non-GMO and kosher. Crispy Cats are also big on flavor and fun. They’re going to remind you of the candy bars you ate as a child. The crunch comes from brown rice crisp and the bars’ other ingredients are highly recognizable, like organic dark chocolate, brown rice syrup, tapioca, agave syrup and coconut or almonds. 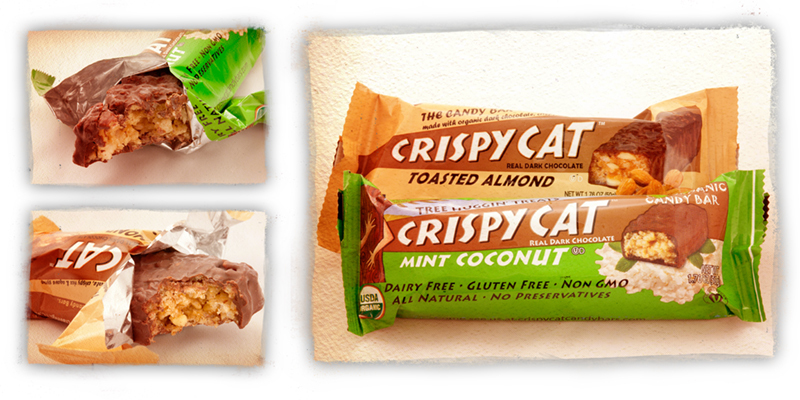 Crispy Cats come in two flavors: Mint Coconut and Toasted Almond. Let’s be real, we inhaled BOTH flavors, but there was a slight preference for the toasted almond. Crispy Cat bars are made by NuGo, a company based in Pittsburgh, PA. They never use hydrogenated oils or trans fats in their products and never use waxy vegetable fat compounds in place of real, delicious chocolate. NuGo is committed to creating healthy snacks. You can buy boxes of bars directly from NuGo’s website, but the company has a store locator online and you can see where Crispy Cats are prowling in your neighborhood. We got ours locally at Wegman’s in Maryland. Other chains that carry them include Whole Foods and the Vitamin Shoppe. Also, check out the The Vegan Store online and Amazon.com – both online sources for Crispy Cats. Make no mistake, we are not experts in the ways of Indian cooking. No way-no how. Indian cuisine is complicated and a true art. But sometimes, we try our hand at an Indian “knock-off.” Like this recipe. Part of what is so incredible about Indian food is the complex layers of flavor. We attempt to recreate that in this recipe by using a variety of spices at different points during cooking. This recipe is both comfy – who doesn’t love mashed potatoes? – and sophisticated. You can make it for a date or company, or just cook it up for yourself and enjoy the leftovers. 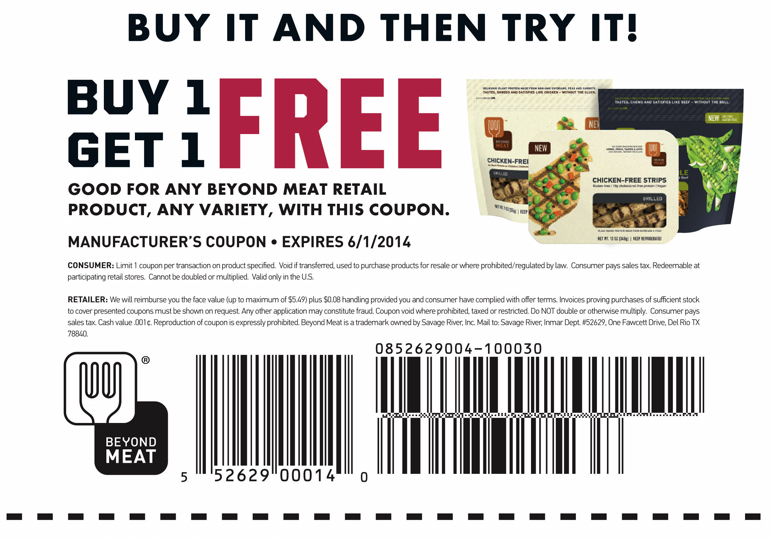 We love the Beyond Meat lightly seasoned “chicken” strips in this recipe, and the company was kind enough to share a coupon with us for you, too. But if you can’t find it near you, try tempeh, seitan or even chickpeas. Start by making the marinade for the Beyond Meat strips. In a large bowl, combine peach jam, fresh ginger, fresh garlic, thyme, cinnamon, Worchestershire sauce, salt, pepper, garlic chili sauce and olive oil. Stir well and toss in entire pack of Beyond Meat strips and red pepper strips. Stir to coat and allow to marinade at least one hour or up to overnight. About 30 to 45 minutes before serving the meal, peel all the potatoes and dice into similar size cubes. Add to boiling water with 3 cloves of chopped garlic and cook until fork-tender, about 30 minutes. Drain potatoes when done and put in a large bowl with Earth Balance, almond milk,curry powder, cumin, red pepper flakes and peas. Smash with a potato masher until the texture/smoothness you prefer is achieved. Season with salt and pepper, and set aside until ready to eat. To complete the Beyond Meat, sauté chopped onions in Earth Balance in a large skillet until soft and browned. Add Beyond Meat, peppers and marinade. Simmer about 5 to 7 minutes, until everything is warmed through. When done, fold in the spinach. The heat will quickly wilt the greens. 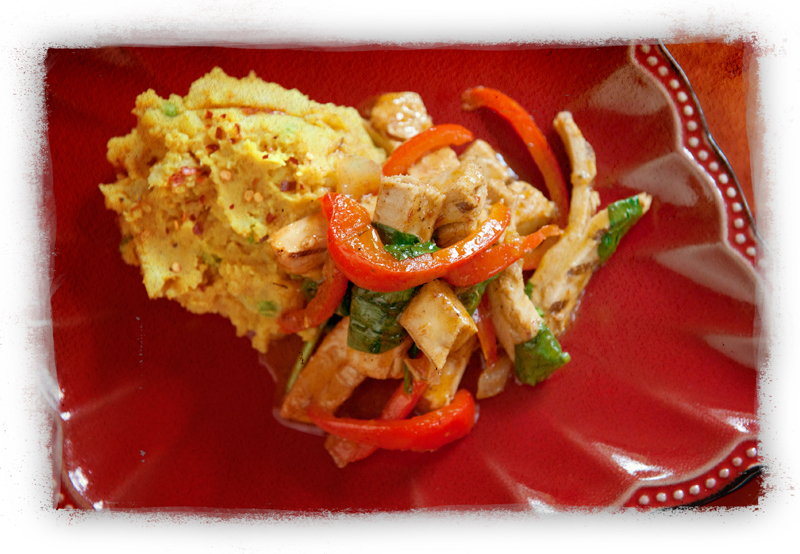 Serve a large portion of curry mashers with the Beyond Meat, veggies and sauce over top. If you like, top with cilantro, red pepper flakes or vegan yogurt for a more authentic Indian experience. Because we want you to run out and get some Beyond Meat for this recipe, please click on this link, generously provided by Beyond Meat, for a coupon!